Baton Rouge is the capital city of the state of Louisiana and home to Louisiana State University. The city of Baton Rouge has a plethora of options for dining, shopping, and entertainment, including Blue Bayou Water Park and Dixie Landin' Amusement Park. Its downtown area features many restaurants and free outdoor entertainment for the family, as well as beautiful views along the Mississippi River levee. Baton Rouge also provides many employment opportunities including Exxon Mobile. Looking to purchase a home in Baton Rouge? Check out our list of subdivisions by clicking here or click the below links to search for available homes in Baton Rouge. Visually oriented? No problem. 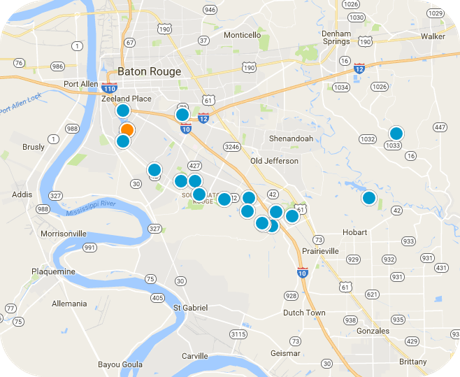 Take a look at our easy-to-use map of Baton Rouge homes for sale.